We love colour at Kitui. It’s what we’re renowned for. Our colouring team are highly qualified and very skilled hair colour experts who have vast experience and technical excellence in delivering the finest hair colour for you. When it comes to the hottest trends in colour Kitui is at the forefront of contemporary techniques. We were doing Balayage way before it was cool! Weekly catwalk and editorial inspired in house training sessions, as well as trends spotting trips to London and at least six visits a year to L’Oréal headquarters in Hammersmith for our team shows our commitment to continually grow our knowledge and expertise. Consistent education for all team members ensures that we will always be ahead of the game and setting trends, not following them. Your hair colour experience at Kitui is completely personal to you. Every time you visit we will reassess what is working, what we could tweak and what needs a complete transformation. We like to take traditional colours and application methods to add a bit of a twist in order to develop a completely bespoke colour experience for you. These are complimentary tailor made consultations so to book your session get in touch. Balayage is a colouring technique used to create natural looking highlights – perfect for blondes, brunettes and redheads that want a subtle, sun-kisses look. Used as an alternative to foil highlighting, it is the action in which hair colour is swept or painted on to the hair to create depth and dimension. Balayage highlights are the in-salon colour service choice among celebrities, models and fashionistas – those that demand hair colour to be designed exclusively for them. Balayage upkeep is less expensive than traditional highlights. Many clients go up to six months between appointments as the natural hair colour will blend in with the natural-looking, painted highlights as it grows. Balayage hair colour technique allows your colourist to utilize their creativity and artistic talent to personalize the placement of each highlight for a customized result. If your Balayage isn’t done correctly you can end up with excessive overlapping that can cause damage which will lead to extremely dry hair and even hair breakage. That’s why you should only see a professional that specializes in Balayage and free hand hair painting techniques. Our professional staff were training in Balayage and perfecting their own techniques before it was cool, we really do believe Balayage is our forte at Kitui. We are proud to work with Olaplex In our opinion, Olaplex the breakthrough hair product of the decade. We are able to achieve colours and complex pastel palettes that were never before possible, all because of this revolutionary new product. 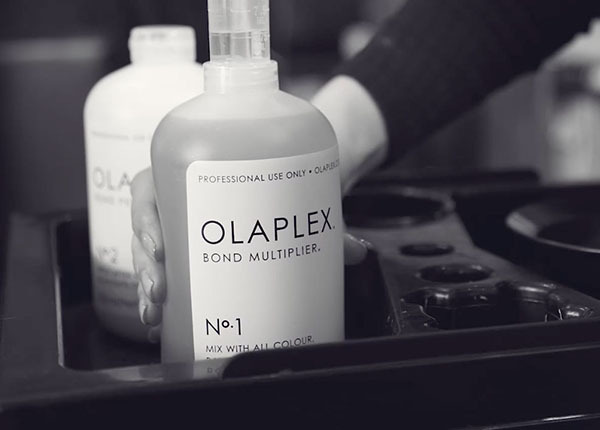 Olaplex has the potential to restore the health of all damaged hair types. Literally repairing the internal structure of the hair as your colour develops, enabling us to push the boundaries of lightening like never before. Especially beneficial for over processed/bleached hair. Please ask for Olaplex as an add on service at your next visit to guarantee your that locks will look and feel stronger. All prices include a consultation. Cost of cut and finish are additional. All new clients must attend a face to face consultation with skin ans strand tests 48hours before any colour service .